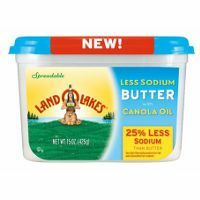 Land O Lakes® Less Sodium Butter with Canola Oil delivers the great taste of Land O Lakes® Butter, made with fresh cream, canola oil, and now less sodium! I love this product! It really has a creamy buttery taste and is good to cook with and as a spread. Love this product. A great buttery taste. We like land o lakes taste much and we use the coffee cream too. Great product. Very easy to spread! !